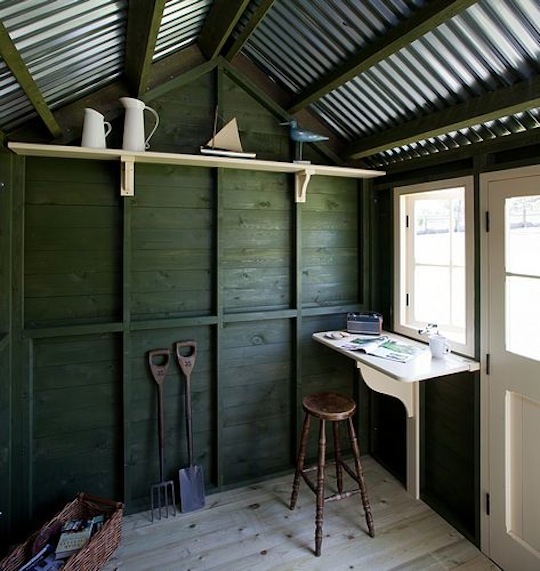 Any surface can be a desk for a moment, but I've found the desire to create the perfect place to work has inspired some great design. 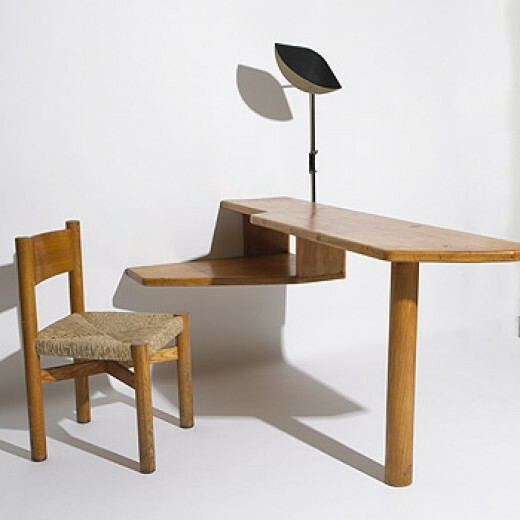 The desk above is not meant to be a place owned by anyone, but rather a shared place, designed by Charlotte Perriand for the Hotel du Doron, Meribel-les-Allues, France, in 1947. 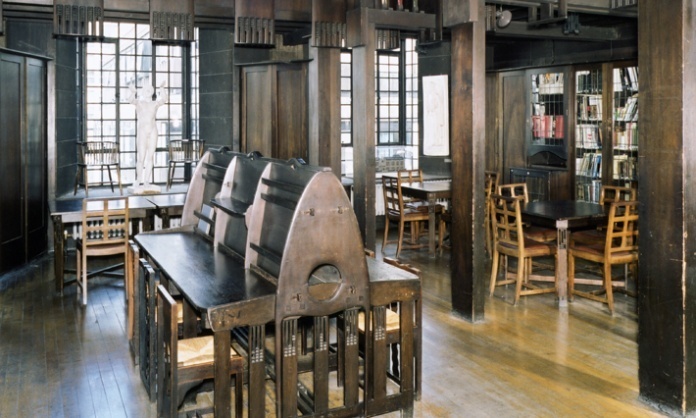 Above: In another sort of shared space, Charles Rennie Mackintosh designed these desks as part of the Mackintosh Library in the Glasgow School of Art, 1896-1909. 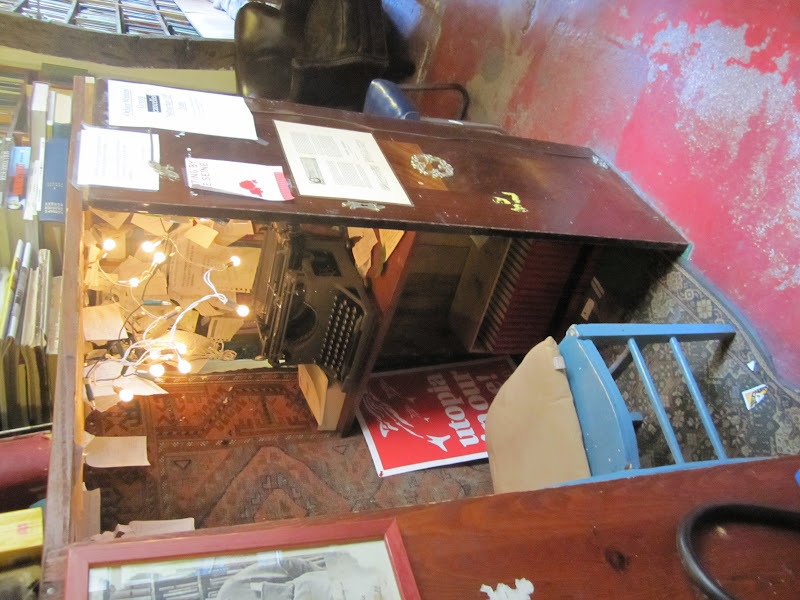 Above and below: At bookstore Shakespeare and Company in Paris, the owner George Whitman always welcomed visiting writers, and gave them places to sleep and to work in the store. 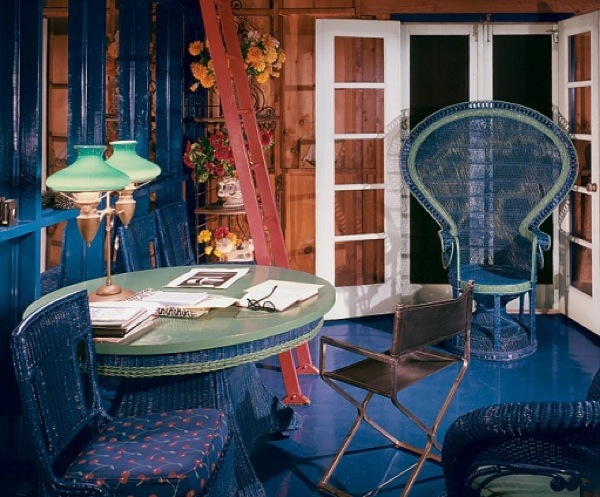 He took over the store in 1951, and ran it until he passed away in December last year at the age of 98. His daughter continues to run the shop. 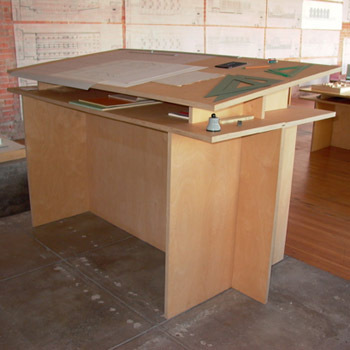 Above: This table is also a shared desk in motion. 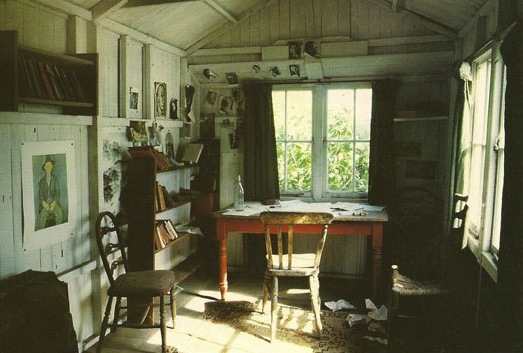 Something inspiring about that. 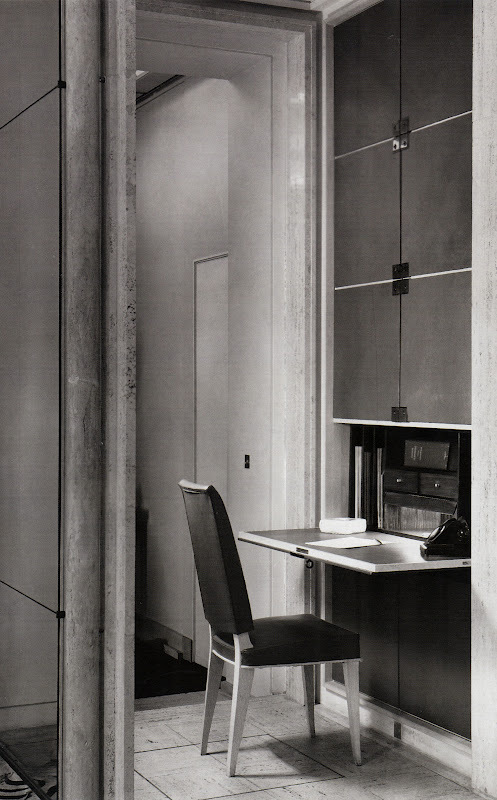 Above: Maxime Old designed this pull down writing table in 1948 for his own gallery space. Above: That photo of the previous pull down writing table reminded me of this one of a Danish home featured in "A Space of My Own" by Caroline Clifton-Mogg. 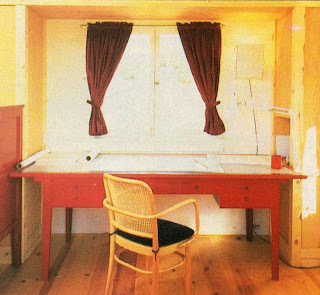 Above: Here the idea of a pull down desk is amplified, used in a modern way with fantastic impact. 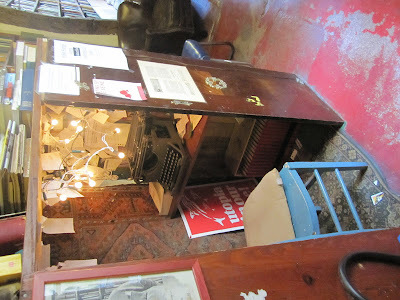 Revealing the red plane inside the wall is a thrilling surprise. 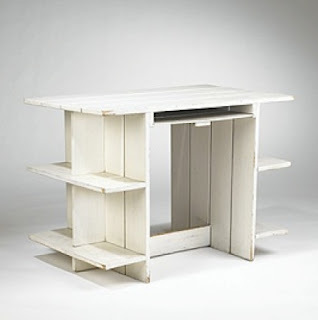 This is a project by Pulltab Design. Above: Another dramatic use of red, this writing table (Bureau Plat) was designed by Gilles Joubert in 1759. It can be seen at the Metropolitan Museum. This piece would need to float in a room as it's so astounding on all sides. 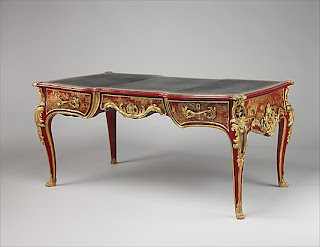 Louis XV furniture has a wonderful exuberance. Above: This Warren Platner desk uses shiny metal (brass not gilt) in a way that conveys formidable power, much as the Louis XV writing table does. It very much needs to be the focal point of a room. 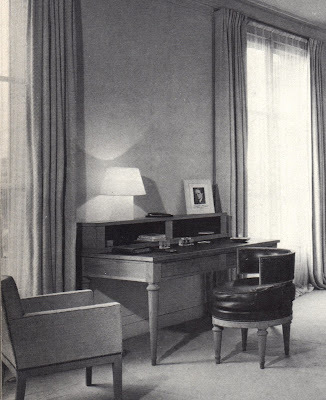 Above: This desk by Jean-Charles Moreaux from 1935 conveys more thoughtful power, using classical columns brings to mind the Parthenon and Andrea Palladio. 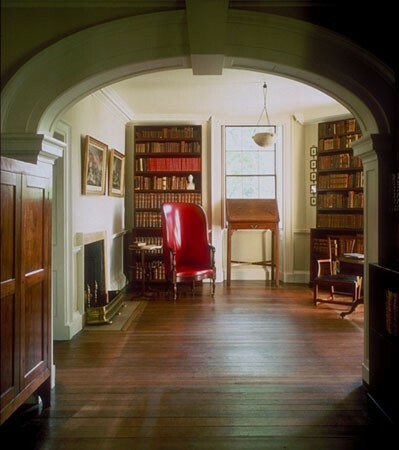 The lack of fussy ornamentation, and the white paint gives it a 20th century character. Above: In the same year, 1935, but in a very different direction, Gilbert Rohde designed this desk, an early use of a biomorphic form. This shape needs room to breathe, something in common with the French writing table, the Platner desk and the Moreaux desk. 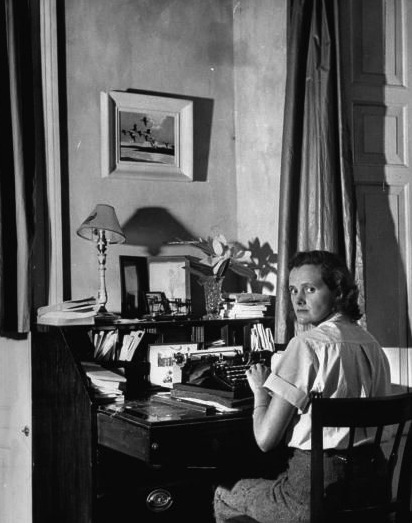 Above: Charlotte Perriand designed the "Boomerang Desk" in 1938. 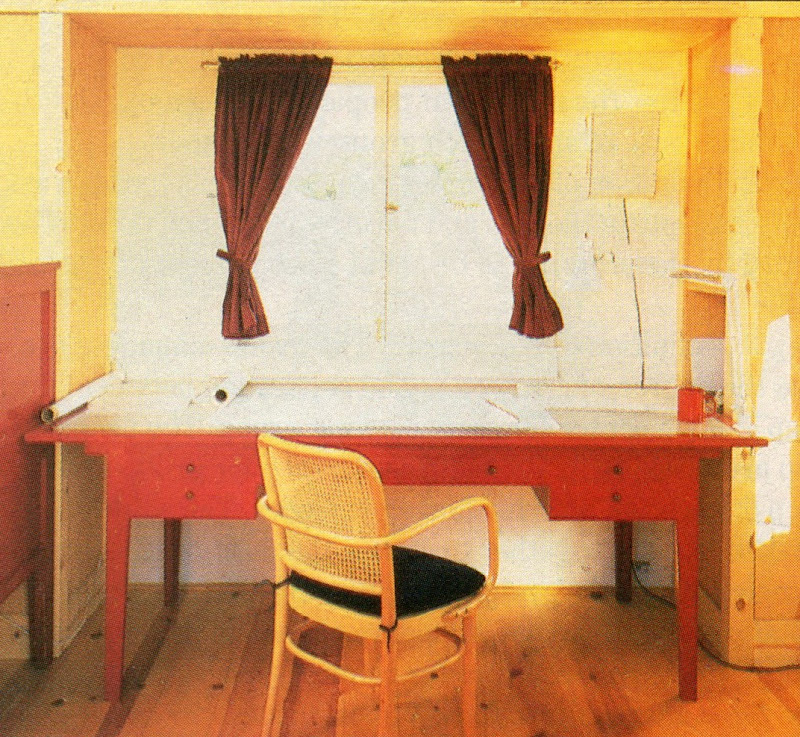 A year later she executed the shaped desk shown here. 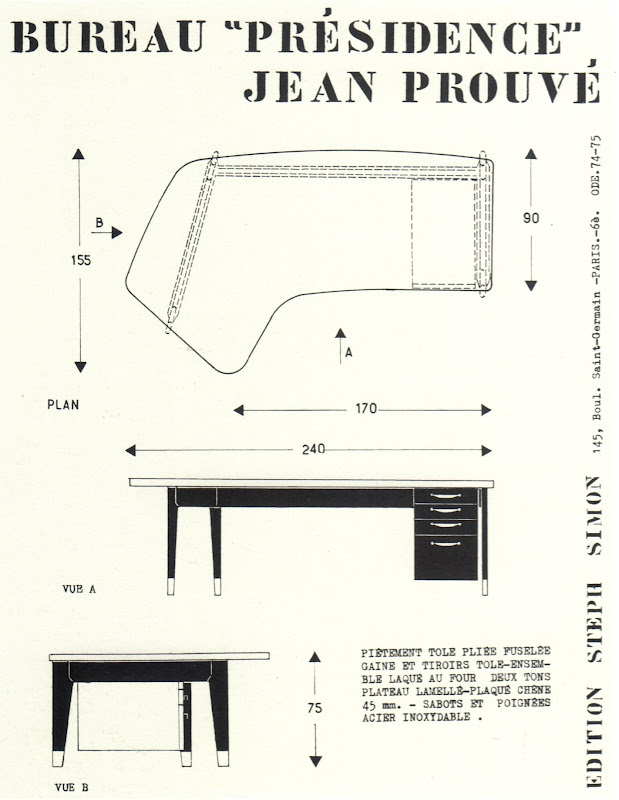 Above: Designed by Jean Prouve in 1950, the generous curve of the front of the desk allows for extra visitors...a cross between a conference table and a desk. Charlotte Perriand and Jean Prouve collaborated often, and it's likely Perriand was involved with the design for this piece when you see her earlier work. 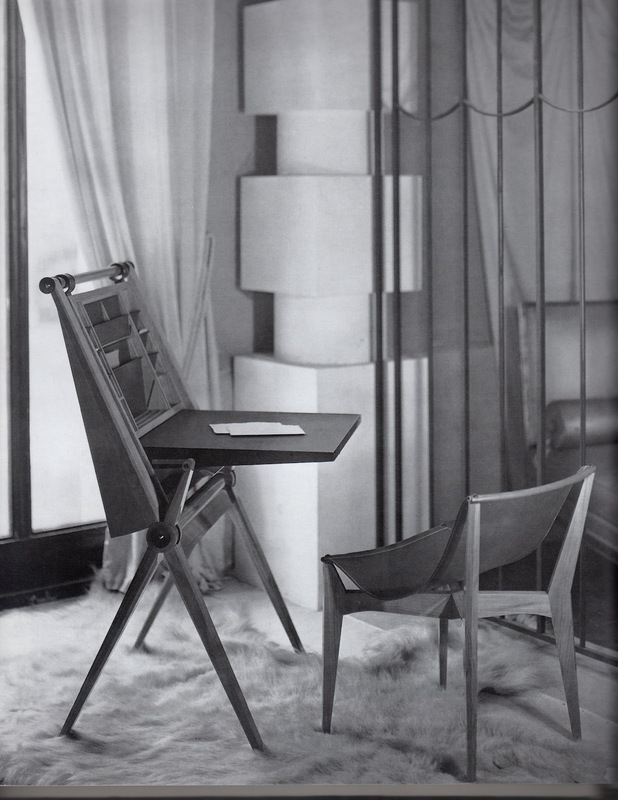 Currently some of the pieces that were attributed to Prouve are being proved to have actually been her designs. 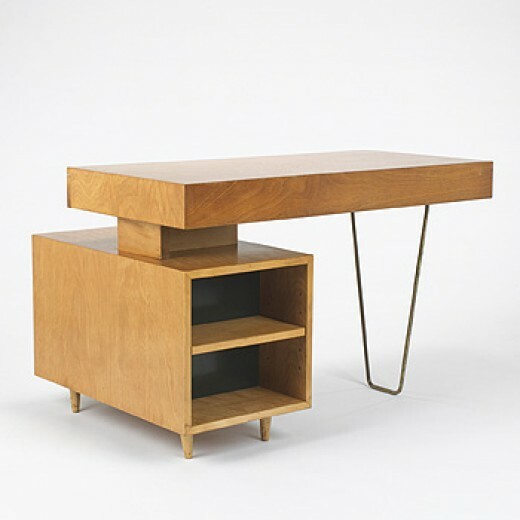 Above: In 1953 Charlotte Perriand designed this table desk. 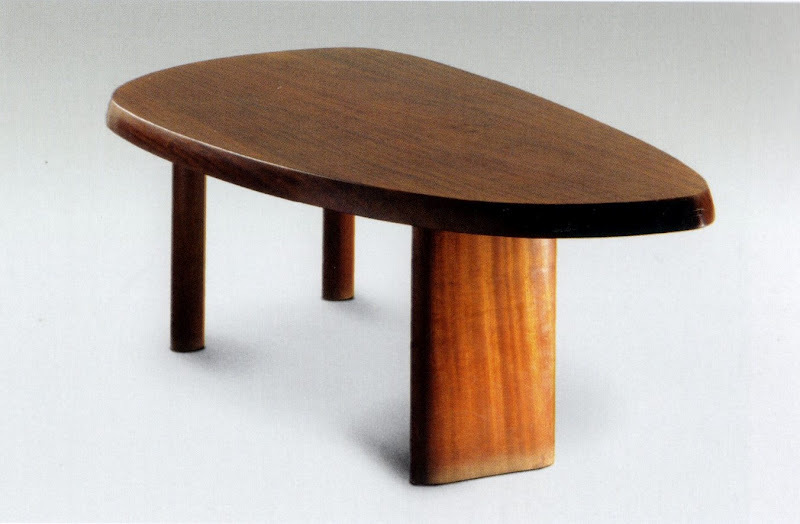 She was influenced by her years in Japan, which comes through in the way she uses solid shaped pieces of wood, slightly curved on the edges, and choosing the blocks for their beautiful grain pattern. 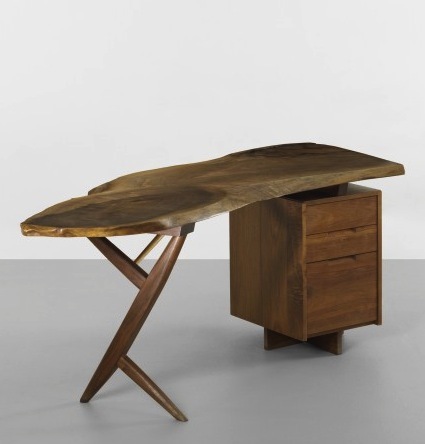 Above: George Nakashima executed this "Cross-Leg Desk" in 1976 out of Black Walnut, Hickory, and Rosewood. It uses the irregular shape and the single file pedestal of the Prouve and Perriand pieces, but is even more sculptural, handmade. 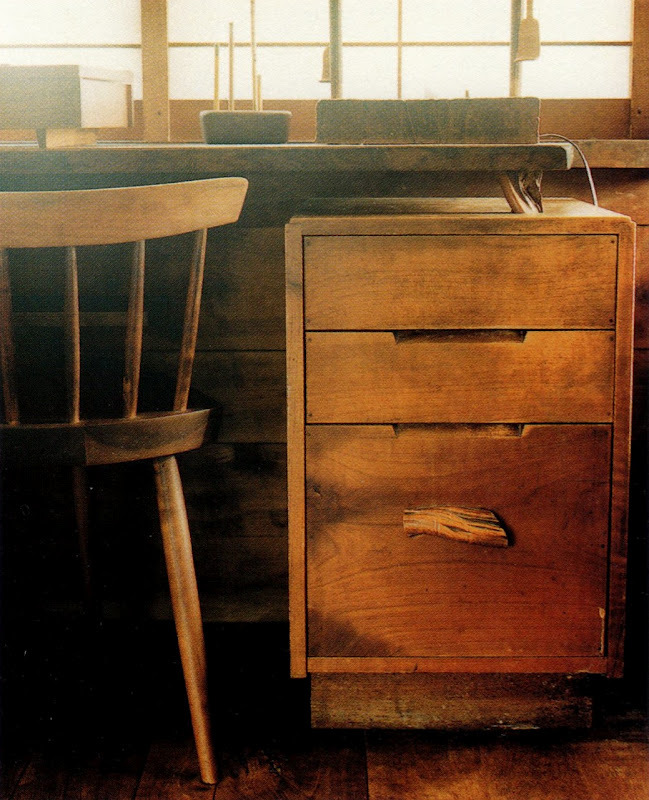 Above: A detailed view of a drawer in Nakashima's home. 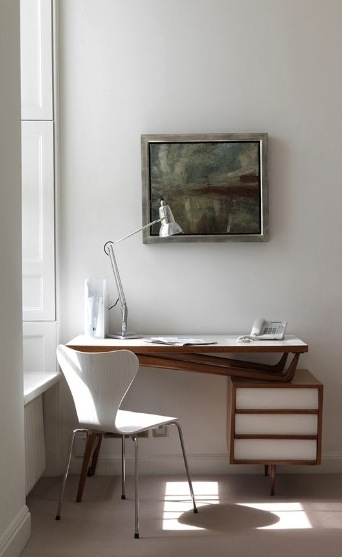 I love the way he slightly suspended the top over the file drawer on small pieces of wood. 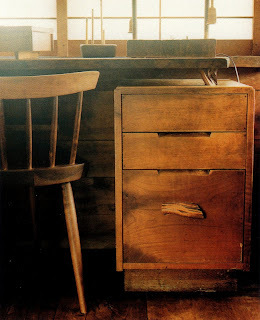 This photo is by Leslie Williamson from her book "Handcrafted Modern". 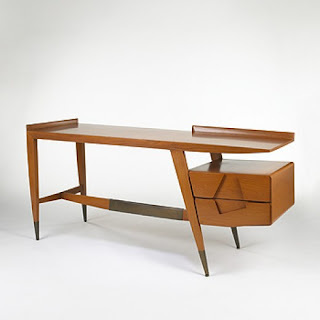 The composition of a desk with a single file drawer and a means of support has been handled in so many creative ways...here are a few mid century examples. 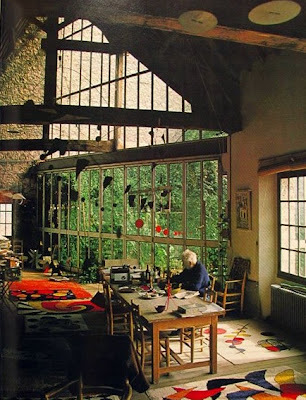 I haven't found any attempts at this asymmetrical composition prior to that time. Above: This looks to me like a Carlo Mollino desk in a project by Michaelis/Boyd, interiors by Sarah Delaney. 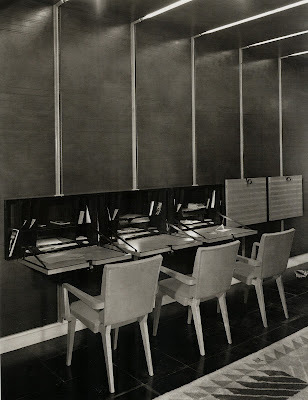 Above: Desk by architect Samuel Glaser, 1953. 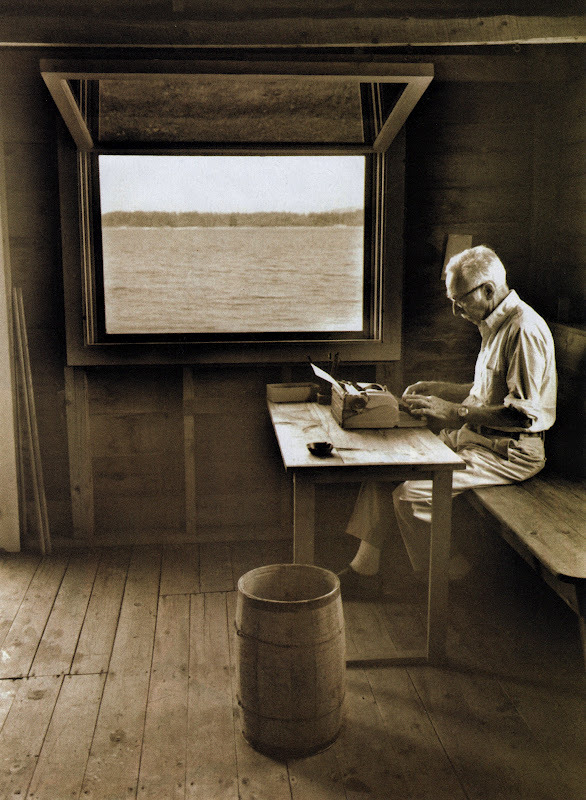 He is known for the Star Market in Newtonville, Massachusetts that spans the highway. 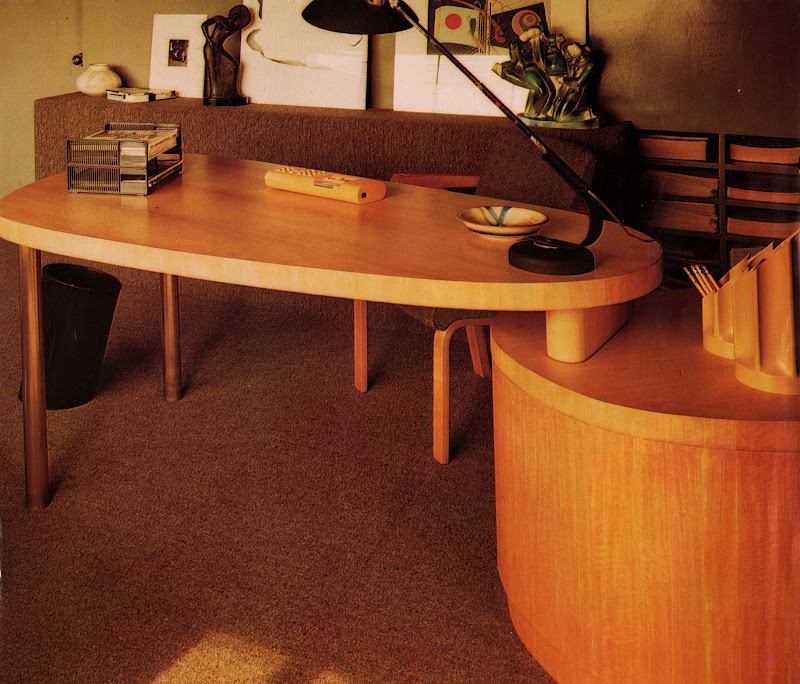 Above: Desk by Greta Magnusson Grossman for Glenn of California, 1952. Above: Desk by Gio Ponti for Singer & Sons, 1953. Ponti is quoted as saying "This is my masterpiece...it is a piece of furniture that is very simple but not formally inert". 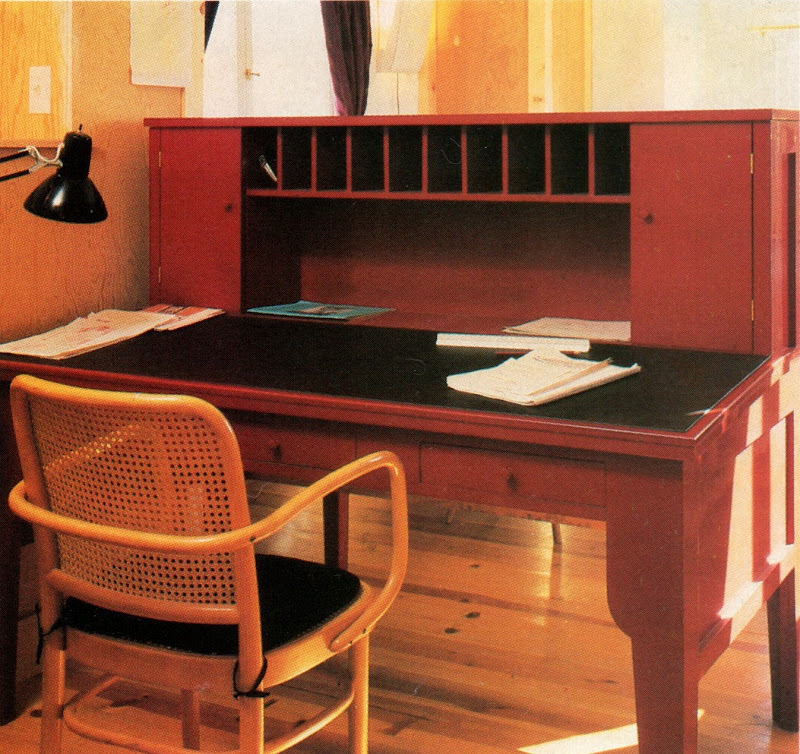 Many people prefer desks with storage for stationary and correspondence above the writing surface where it's close at hand and easy to see. Above: By Georg Friedrich Kersting (1785-1847), "Man at His Desk" 1811, from the book "Room With a View". 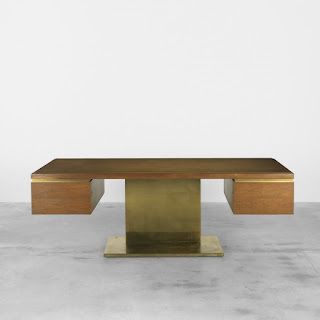 This was a show at the Metropolitan Museum in 2011. Above: Drawn by Maira Kalman for her NY Times blog "And the Pursuit of Happiness"
Above: Daphne Du Maurier photo from Life magazine. Above: A room and a desk designed by Jean-Michel Frank in the 1930s. 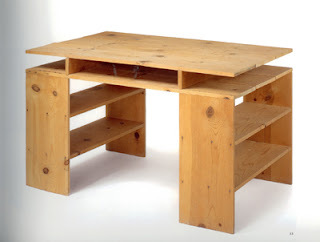 Above: Designed by Christopher Alexander in the 1980s, this was part of an investigation into a line of office furniture he and his colleagues at The Center for Environmental Structure, (which he founded in 1967), were developing. 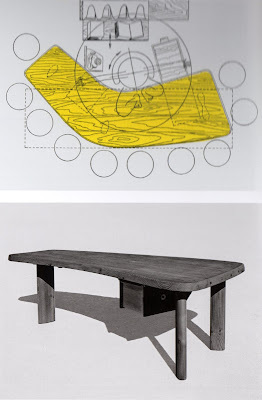 He is an Emeritus Professor of Architecture at UC Berkeley, and best known for his influential books including "A Pattern Language". 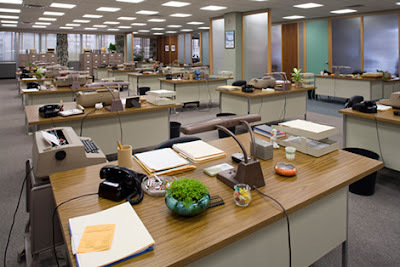 Alexander has a horror of spaces as shown below (this from the Mad Men set), and has spent a lot of time thinking about how to make work spaces satisfying and personal. 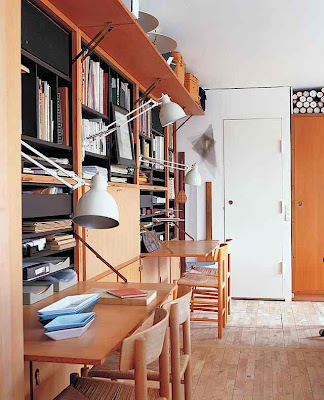 He's attempted to design a line of office furniture that would fit user's archetypal ideas of what a desk, a bookshelf, and so forth, should be, and would allow user's to make a lot of choices for themselves. 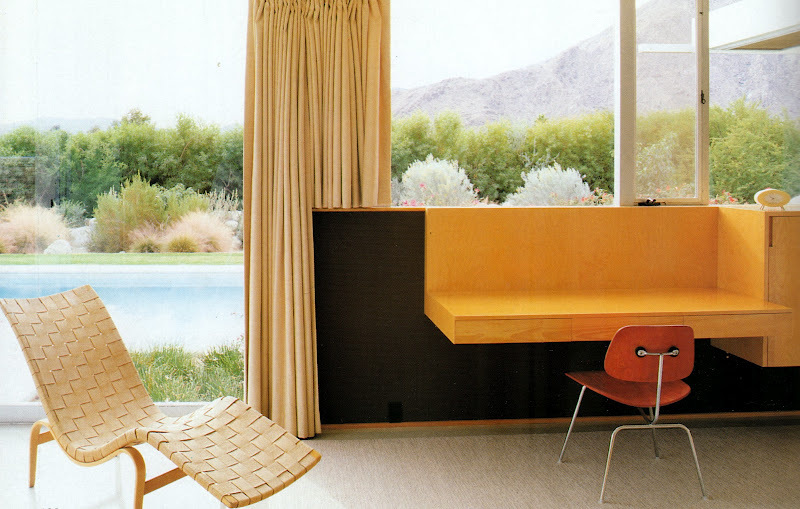 Above: The office pool on the Mad Men set. 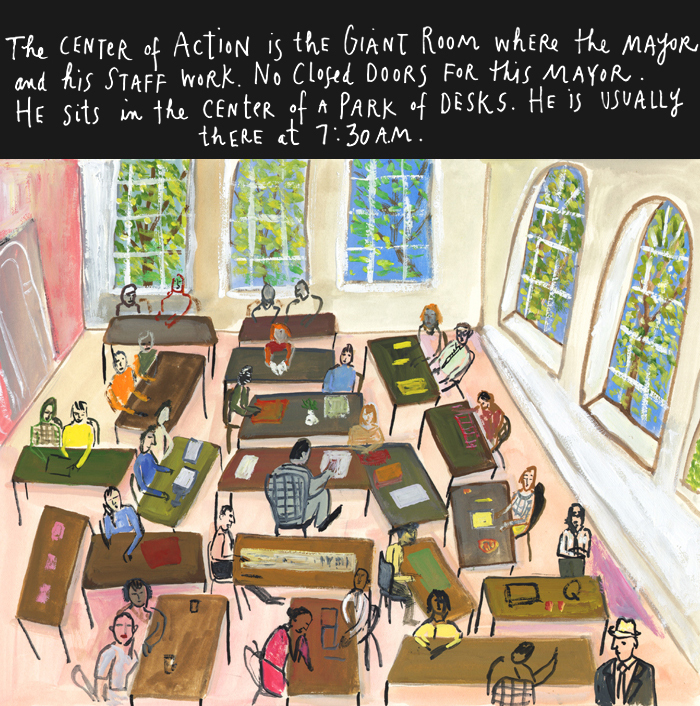 Above: That the NY Mayor sits in the center of this warren of desks changes the dynamic, raising the status of being in this room. 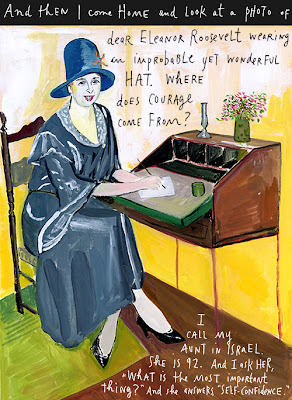 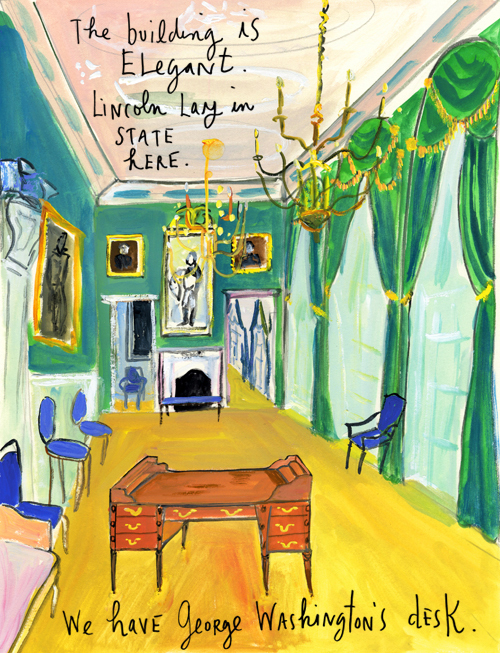 This was drawn by Maira Kalman for her NY Times blog "And the Pursuit of Happiness". Above: In an office I designed for a film production company I used construction grade fir to give a warm relaxed character to the open area workstations. The following desks have all had a lot of camera time on TV. 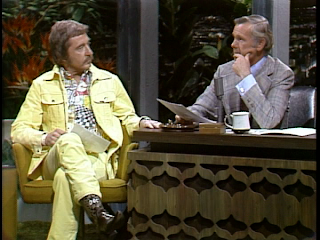 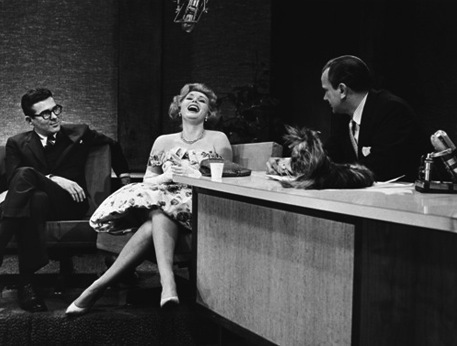 Above: Johnny Carson and Doc Severinsen. This was Carson's desk in the '70s. Above: A built in desk in Richard Neutra's "Kaufman" house, photo by Michael Donnelly. This house was restored by Marmol Radziner. 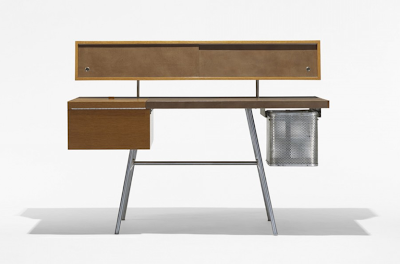 Above: Floating desk, balanced on legs at the front only, from a project by Stephen Kanner. 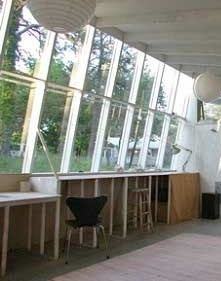 Above: In an art studio the different desk heights allow for places to work standing or sitting. 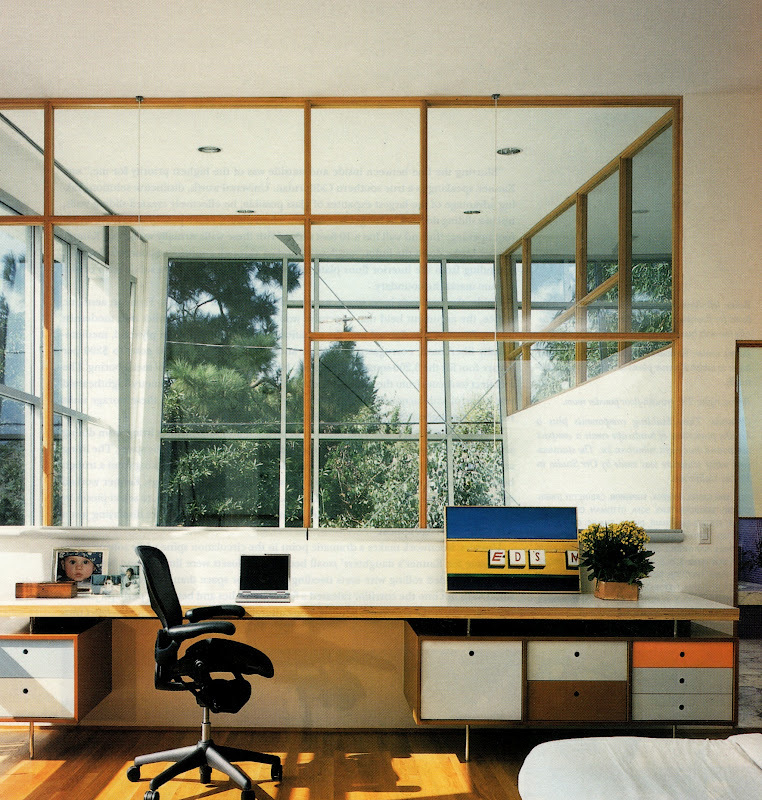 Above: Fitting a desk into an all purpose Living Room/Family Room I designed for a bungalow in Venice. 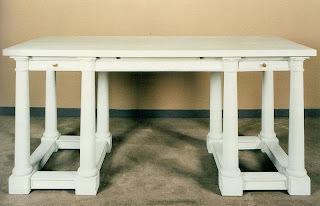 Some choose a writing table...storage isn't the priority, and they have a lighter look. 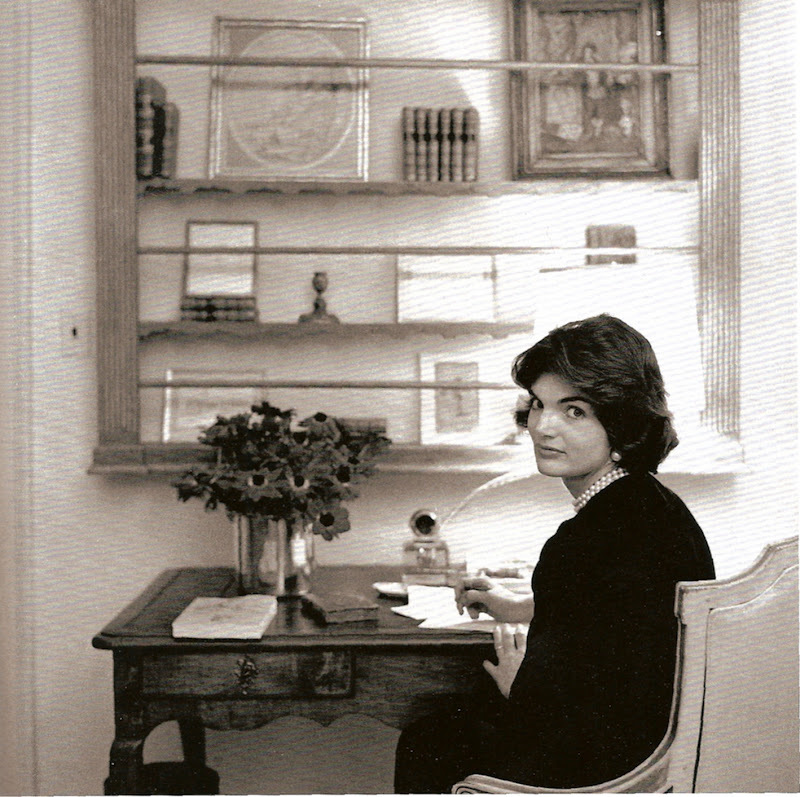 Above and below: First Ladies Betty Ford and Jackie Kennedy. Above: Christopher Alexander designed this desk as a prototype in his line. 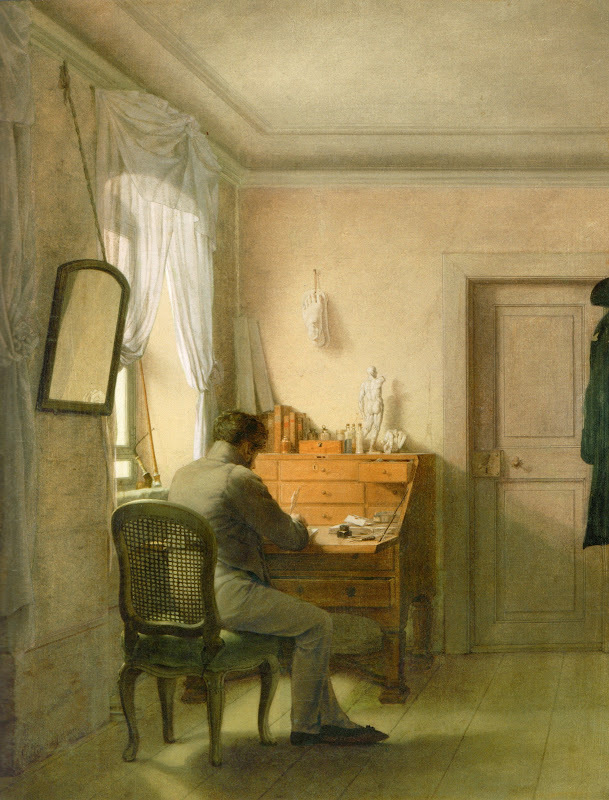 He felt this was among the most successful pieces. 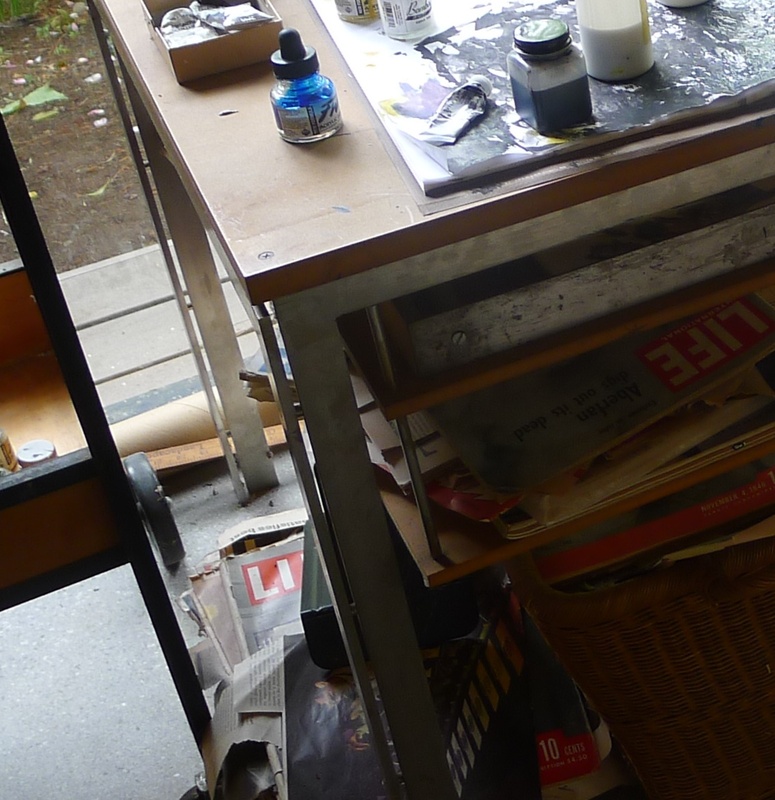 He often uses red on his pieces, which makes them memorable and as he says "life giving". Above: From Maira Kalman's NY Times blog "And the Pursuit of Happiness"
Above: This is the desk in Virginia Woolf's writing shed at Monk's House, Sussex. 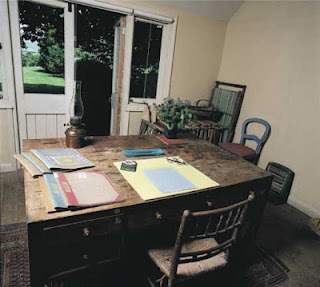 This is where she wrote Mrs. Dalloway. 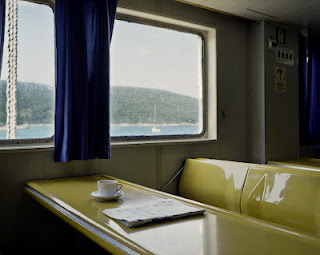 Photo by Eamonn McCabe. 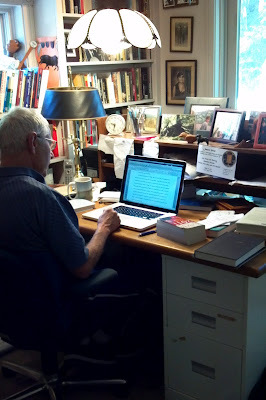 Above: My dad, Writer John Clayton, writing at his desk. 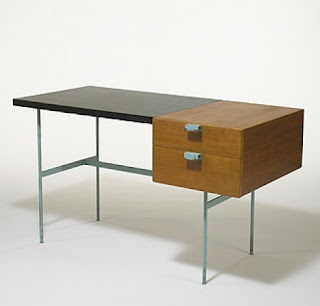 He's a believer in function and likes the simplicity of a table top on two metal file cabinets. Above: Charles Dickens writing at his desk. There is a group of fervent believers in the advantages of a standing desk. Their claim is that standing at a desk offers better circulation and better posture. 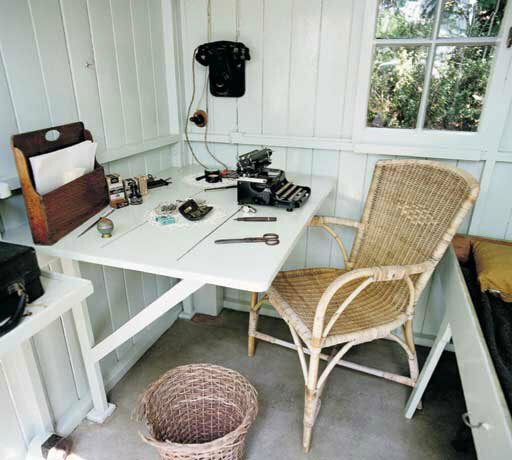 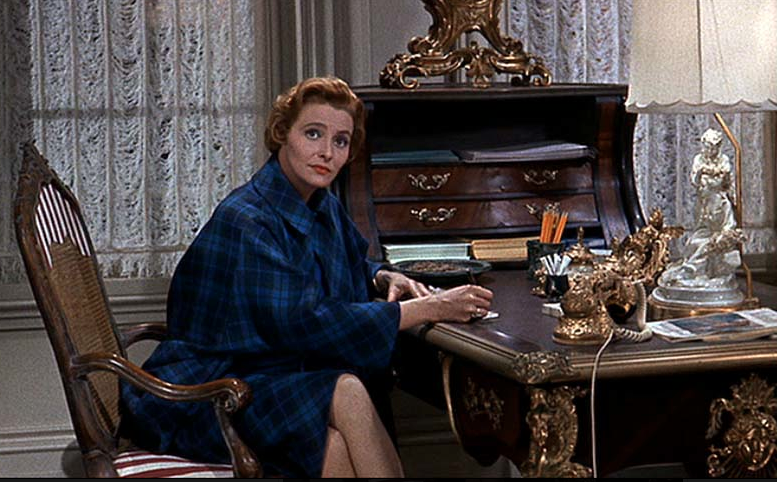 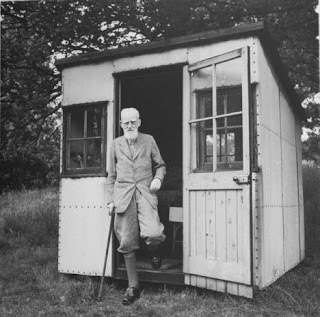 Some frequently cited users of the standing desk are Jefferson, Churchill, and Hemingway. 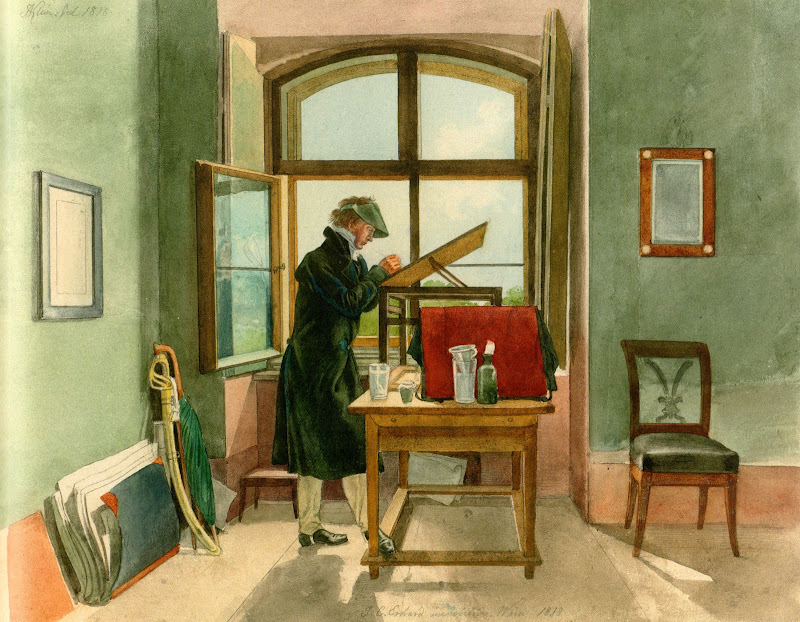 Above: Johann Adam Klein (1792-1875), "The Painter Johann Christoph Erhard in His Vienna Studio 1818". From the book "Room With a View". This was a show at the Metropolitan Museum in 2011. 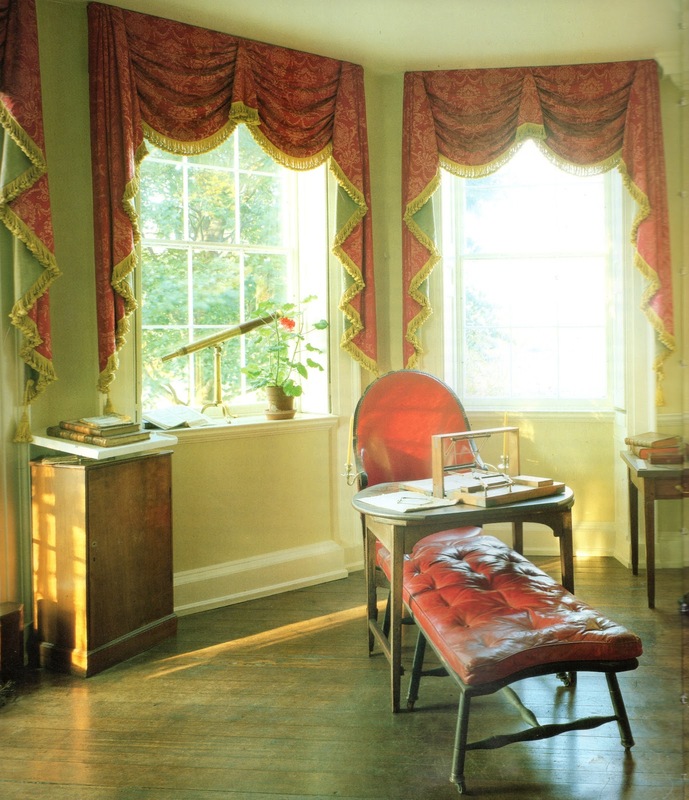 Above: Thomas Jefferson's Study, showing his standing desk by the window. Above: Scotts of Thrapston offers the "Reading Room", inspired they say by Virginia Woolf's cottage. Above: In 1934 Gerrit Rietveld designed this "Crate Desk". The use of simple even recycled materials is incredibly modern. 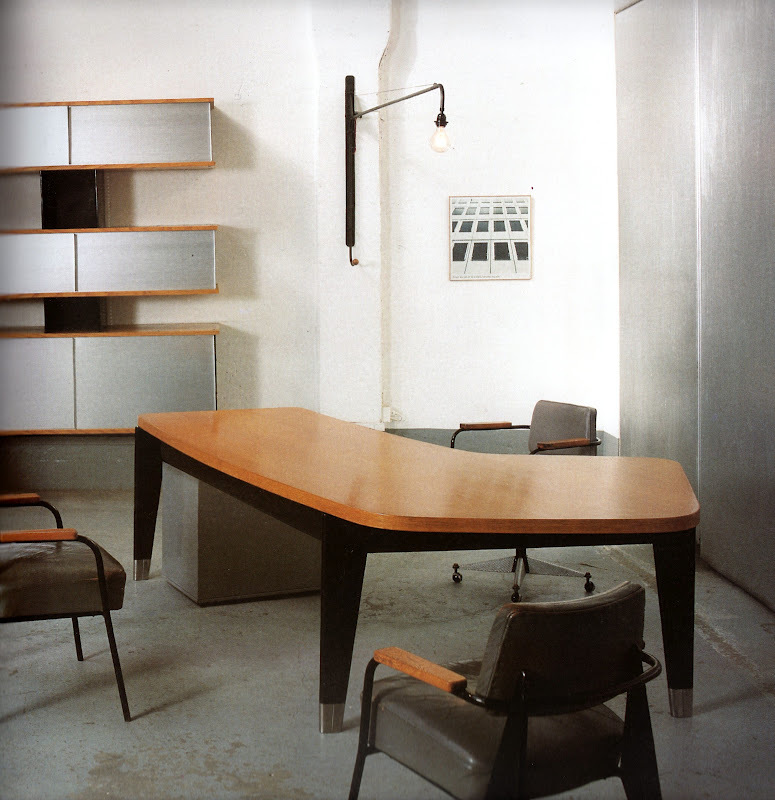 Above and below: In our studio a steel and plywood desk designed by Poul Kjaerholm and fabricated by E. Kold Christensen shows its exposed structure. Above and below: This rosewood box from 1825 is actually a portable desk. You can see it in the open position below. 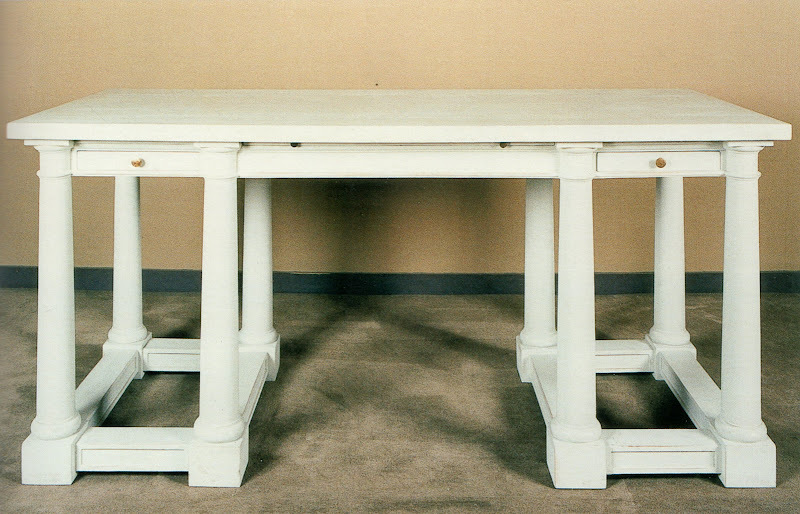 Above: This portable desk was designed by Thomas Jefferson. 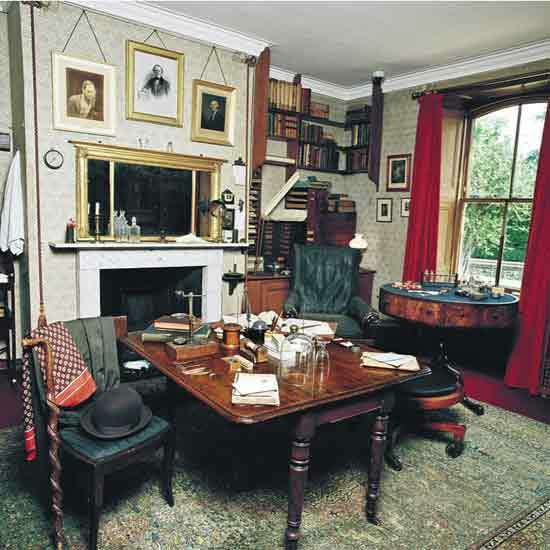 On top of the desk is an invention of his to create copies of his work while he was writing. 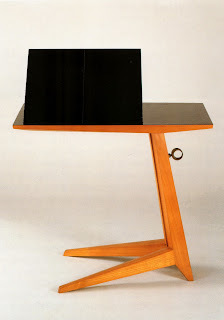 Above: A portable folding desk designed by Maxime Old in 1948. 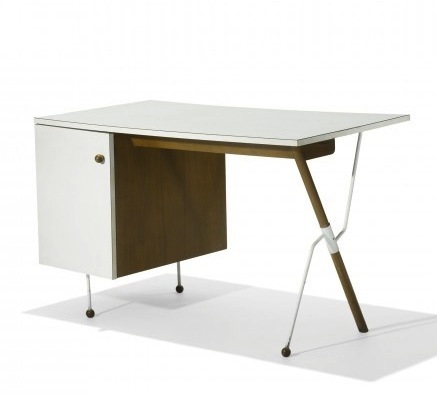 Above and below: In 1955 Maxime Old designed this adjustable height writing table. 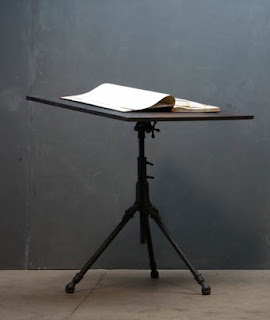 Above: An adjustable drafting table circa 1910. 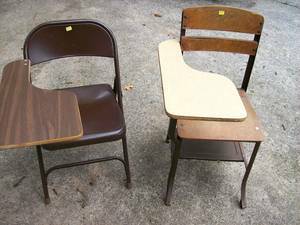 The idea of a table attached to a chair starts in elementary school. 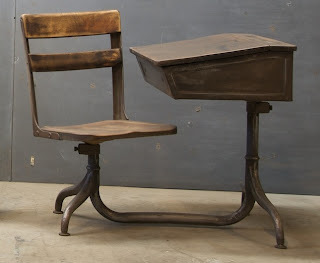 Above: Vintage French school desk, 1930s. 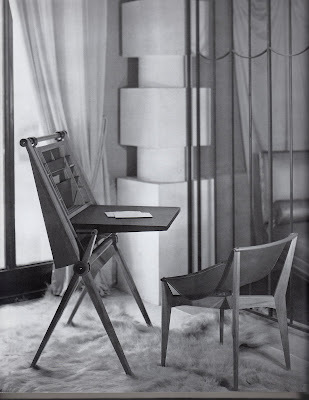 Above: A very basic chair and writing table for taking notes on. 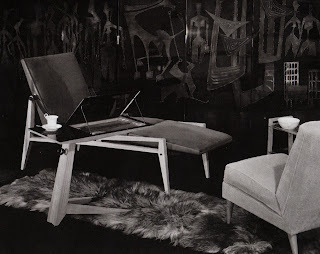 Above: A much nicer chair with tablet. 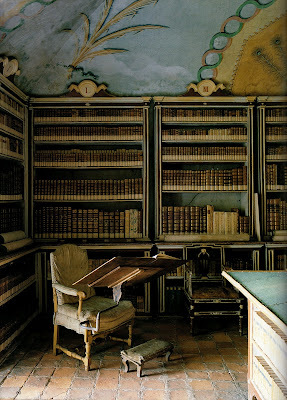 This is from the 18th century library at the Castello di Masino. Photo by Simon Upton, World of Interiors 7/2004. 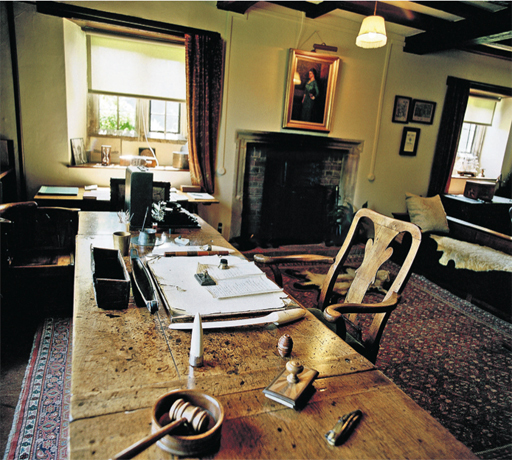 The chair with a swiveling lectern attachment is recorded in an inventory from 1736. 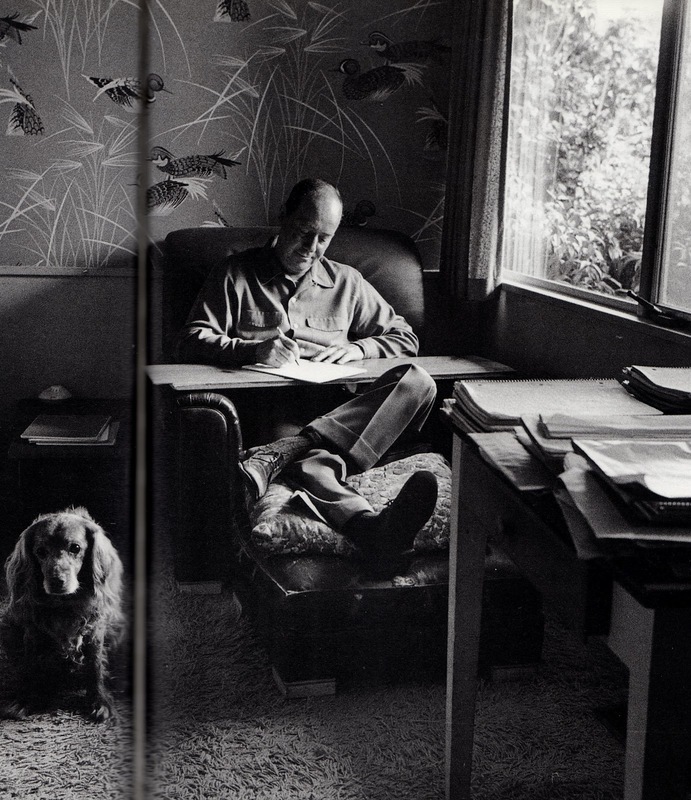 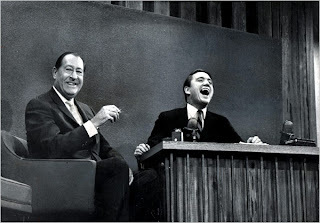 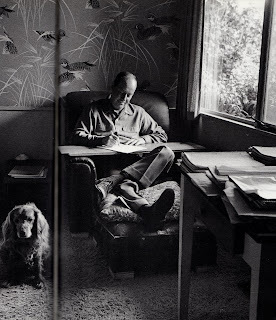 Above: A plank of wood across the arms of a chair is a place for Ross Macdonald to write. 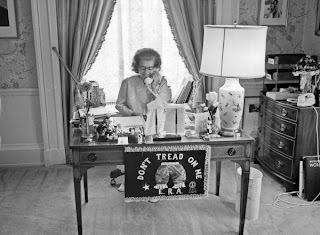 Photo by Jill Krementz, 1974. 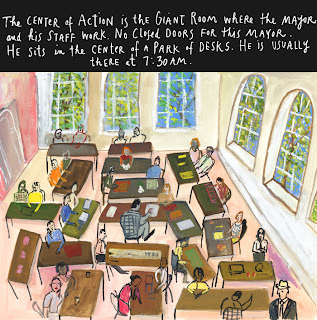 Many have found a table is the best place to work. Above: In a watercolor from the Qing Dynasty, probably late 19th century, a scholar works with a student on a scroll. Above: Truman Capote's writing table in Sagaponack. Above: Calder at work in his studio. 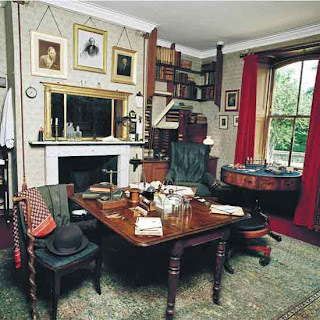 Above: Charles Darwin's study, where he wrote "On the Origin of Species". Photo by Eamonn McCabe This is from an excellent series in the Guardian called "Writer's Rooms". 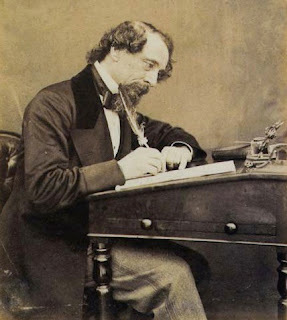 Above: E.B. 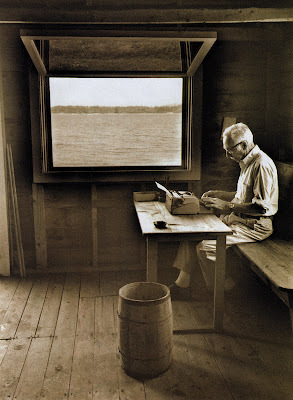 White photographed by Jill Krementz in his cabin, North Brooklin, Maine, 1976. 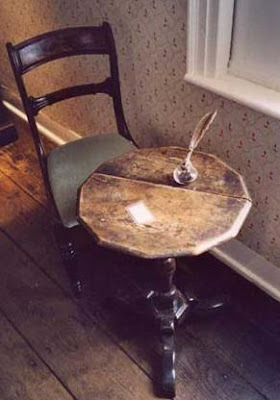 Below: This tiny table is where Jane Austen worked.